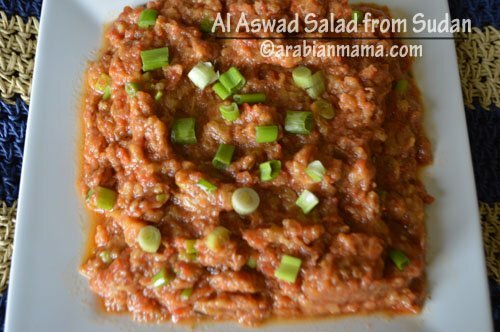 From Sudan : Al Aswad salad!! This time we are traveling down the Nile river from Egypt to Sudan. I’ve never been to Sudan before but I sure had some Sudanese friends over in Saudi Arabia. Sudanese people are known to be very very kind, compassionate and generous. Aswad means black so this salad means the black salad, sounds a little racist don’t you think so? 🙂 It is called that way because it is made of eggplants. 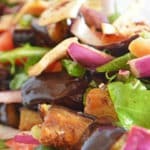 This salad is made with eggplants, garlic, lemon juice, tomato … and some other stuff. 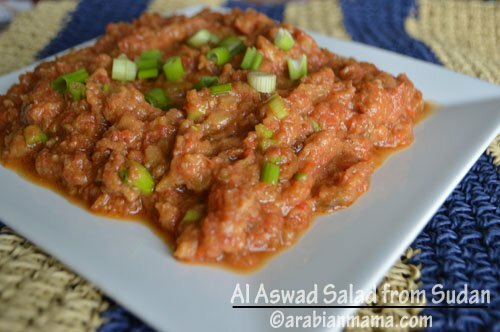 At first I had the feeling that it will taste like the famous baba ghanouj dip but it has its own taste due to the addition of peanut butter. I did not know that peanut butter was a familiar food in Sudan as it was not famous in Egypt until may be 8-10 years ago. This salad turned out very delicious it only lasted 24 hours in my kitchen. 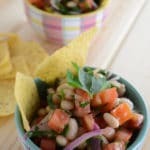 It can be used as a dip, spread or a side dish. 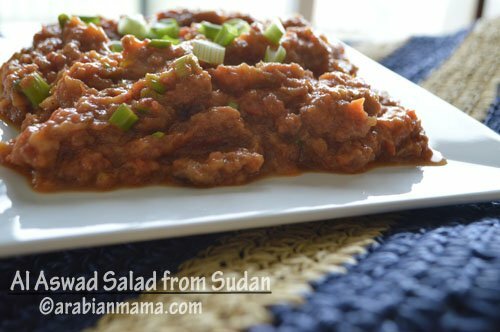 This was my first attempt to tackle the Sudanese cuisine and I have a feeling that we will have a long lasting and strong relationship :). water to liquefy peanut butter. Shallow fry the aubergine in oil and keep stirring until it is golden brown, set aside. Dice the tomatoes, put in food processor or blender, and pulse. In a sauce pan bring the tomato sauce to a gentle boil. With a fork, mash the aubergine, then add to the simmering tomato sauce. Add lime juice and garlic, stir and remove the pan from heat. Liquefy the peanut butter in some water and add to the previous mixture. Add the diced green onion and mix well. Chill in your fridge and serve with pita bread. Except for the addition of peanut butter this also reminds me of Baba Ganoush! It does look interestingly delicious!